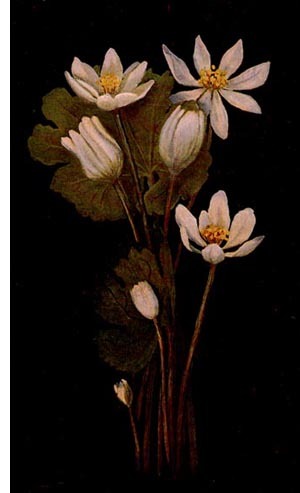 The Blood-root belongs to the poppy family, which includes about twenty-five genera and over two hundred species. These, though widely distributed, are chiefly found in the temperate regions of the North. To this family also belong the valuable opium-producing plant, the -Mexican or prickly poppy, the Dutchman's breeches, the bleedingheart, and the beautiful mountain fringe. A large number of the species are cultivated for ornamental purposes. The poppy is also cultivated for the commercial value of the opium it produces. All the species produce a milky or colored juice. Hence, indeed, we may say that behind beauty there lurks a deadly foe, for the juice of nearly all the species has active narcotic properties. This property is a means of protection to the plant under consideration, for its acrid taste is distasteful to animals. This interesting plant is a native of eastern North America. It blossoms in April or May. Usually but a single flower is borne by the naked stalk that rises from the underground stem to the height of about eight inches. The flowers are white, very rarely pinkish, about one and onehalf of an inch in diameter. The number of petals varies from eight to twelve, and they fall very soon after expansion. The sepals disappear before the bud opens. A single leaf is produced from each bud of the underground stem. It is wrapped around the flower-bud as the latter rises from the soil, and does not develop to full size until after the period of blossoming is over. The necessary food material for the production of the flower was stored in the underground stem during the preceding season. Thus the green leaf is not needed early in the growth of the plant. The adult leaf is kidney-shaped, smooth, and five to nine lobed. When fully grown they are often more than six inches in diameter. The leaf-stalk, which may be over one foot in length, and the radiating veins vary in color from yellowish to orange. Few leaves are more beautiful and graceful than these, both during their development and when fully mature.